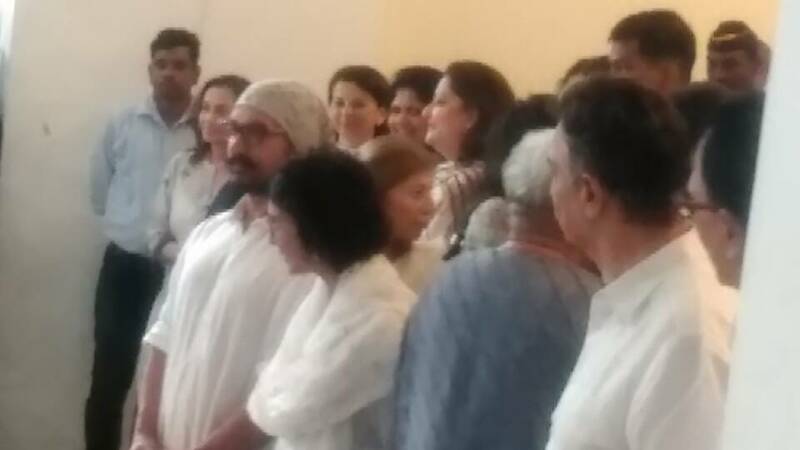 Call it the impact of Rishi Kapoor’s tweet for almost the entire B town including current generation superstars landed at late Vinod Khanna’s prayer meet. An angry Rishi had tweeted about how the current geberation superstars were inconspicious by their absence at the Khanna’s funeral while they had no qualms partying at Priyanka Chopra’s house till late night. We are sure the tweet had its desired impact. From SRK to Aamir Khan, we spotted all big names in attendance. At last count almost 67 big names of the film industry had attended the prayer meet. Those included Farhan akhtar, zoya akhtar, ritesh sidhwani, sanjay khan, arbaaz khan, tabu, Suresh Oberoi, Aamir khan, kiran rao, chunky panday, poonam dhillon, hritik roshan, rakesh roshan, Vivan shah, Prem chopra, Satish shah, Amisha patel, Pooja bhatt, Mahesh bhatt, Dalip Tahil, Ambani family, Arjun rampal, Javed Akhtar, Satish kaushik, Shakti Kapoor, Aditya Pancholi, Madhuri dixit, Malaika arora khan, Anurag Kashsyap, Kapil dev Sonakshi Sinha, Sangeeta Bijalani, Abbas-Mastan, Ashutosh Gowariker, Sonu sood, Tara sharma, Athiya Shetty, Anoop Soni, Roopkumar Rathod, Kaira Advani, Amitab, Abishek, Shweta and Aishwarya Bachachan, Sooraj pancholi, Ramesh, SRK, Hema Malini, Farah Khan, Sridevi, Boney Kapoor, Mustafa, Siddharth Roy Kapoor. Vinod Khanna passed away on 27 April after a prolonged fight with bladder cancer.